A football club director feared for his life when he was forced to resign at gunpoint after a row with a rival, Blackfriars Crown Court has heard. Gianni Paladini said he felt frightened when Queens Park Rangers shareholder David Morris and several other men threatened him before a home match. He alleged he was made to write a resignation letter and give up shares. Mr Morris and six others deny false imprisonment, conspiracy to blackmail, and possession of a firearm. Mr Paldini, 60, the majority shareholder at Queens Park Rangers, claimed his ordeal began when Mr Morris asked if he could have a word minutes before the start of a home game last August. "He said he needed to talk about some shares," said Mr Paldini. But when he went into the chief executive's suite at the Loftus Road ground in west London he was surrounded by several men. Prosecutors have told the court they were all "hired muscle". "Then I knew I was in trouble," he said. Mr Paladini said Mr Morris became "very aggressive" and pulled some documents from his jacket pocket and told him to sign and resign from the club board. Mr Paldini told the court, "I was very frightened... I didn't know why this was happening. I said, 'David, why are you doing this to me?' It was crazy. "Then the man at the back of me told me, 'Come on sign, sign or we will kill you.'" Mr Paladini told jurors that at that point a black man pulled a gun from his pocket and laid it on a table. He went on to describe how he was handed a blank piece of paper and he was told what to write. "When they were dictating to me my hands were shaking. They didn't like that. But I just signed. I didn't want to take any more." Mr Morris then allegedly turned and told him: "The boys will teach you now what life is all about." He said he was repeatedly punched and slapped. Eventually he was able to escape and shouted for help out of a window to a policewoman below. 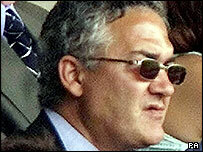 Earlier the court heard Mr Morris was arrested shortly after half-time in the executive box along with several others. A screwed up piece of paper, apparently written by Mr Paladini, and £7,000 in cash, allegedly "wages for the heavies", were discovered. Mr Morris, 50, is charged along with Andy Baker, 40, from Somerset, Barry Powell, 34, John McFarlane, 39, both west London, Aaron Lacey, 36, from Watford, David Davenport, 38, from Buckinghamshire and Michael Reynolds, 45, from north London.